This is from a dust sample collected from a ventilation system filter in a home in Seattle, Washington. The sample was collected in the late Autumn. This home had a moisture problem and the sample also contained numerous mites. People in this home were having respiratory problems. The black particles in this image are tire wear particles. This home was near a major traffic arterial. Microsphaera is commonly known as powdery mildew. It is a genus of the family Erysiphaceae. The Cleistothecium is the ascocarp that contains the ascospores, it is the fruiting body of the powdery mildew. The cleistothecium of the Microsphaera are characterized by their appendages. The cleistothecium itself is a flattened sphere but the appendages vary from needle-like projections to multibranched structures. The appendages may have a bulbous attachment to the cleistothecium or may change little at the attachment. The appendages may be multicellular or a single cell. They may be colorless or the base may be colored for some distance from the attachment. 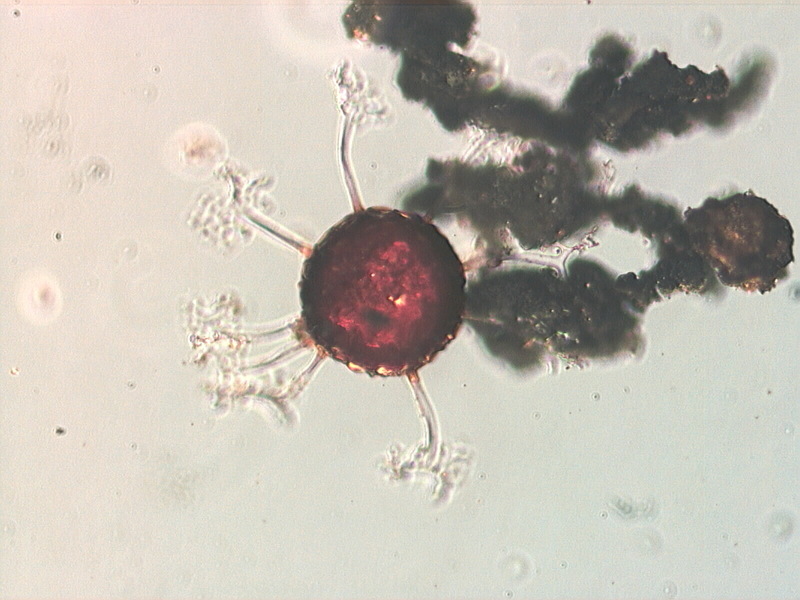 There are a number of mites that feed on the hyphae and spores of various fungi. It is not uncommon to find mites or mite frass associated with fungal debris. Hanlin, Richard T., ILLUSTRATED GENERA OF ASCOMYCETES, VOLUME 1, APS Press, pp. 28-29, 1990.